While it may seem like summer just ended, the 2014 December holidays will be here before you know it. With visions of production deadlines dancing alongside sugar plums in your head, here’s the info you’ll need to set yourself up for audiobook success as we near year’s end. First, note that you’ll need to submit audiobook productions to ACX by December 5th to have the best chance of your title being available for sale by December 31st. What can producers and rights holders do to ensure a smooth production and a speedy trip through ACX’s QA process? Glad you asked! Submit your final audio in well advance of December 5 so your rights holder has time to listen and request changes if necessary. Bone up on our Audio Submission Requirements to make sure you’re producing audio that meets our standards. Mastering. Check out Andrew the Audio Scientist’s video to learn how to make your good productions sound great. Editing. We’ve got two videos to help you out with this one. Get more advice from Andrew and learn how the Audible Studios team achieves seamless edits. Encoding. Never fear, Andrew is here once again to help you get the hang of encoding and file delivery. Schedule time around your due date to review your whole audiobook. Read our post on reviewing your audio the Audible Studios way to make sure you listen critically and provide constructive feedback for your producer. Make sure you’ve got your cover art squared away before your final audio is delivered. See our cover art requirements here. Start thinking about promotion before your book is available for sale. Review Jessica from Audible’s Merchandising team’s tips for promoting your audiobook. If you’ve got audiobook productions that you’re hoping to have on sale for the holiday season, follow these steps, and you’ll be well on your way to achieving your goal. Then, you can focus on lining up projects for January and beyond! 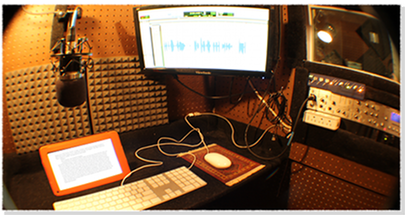 Do you have a tip to help keep audiobook productions on track? Share it in the comments!